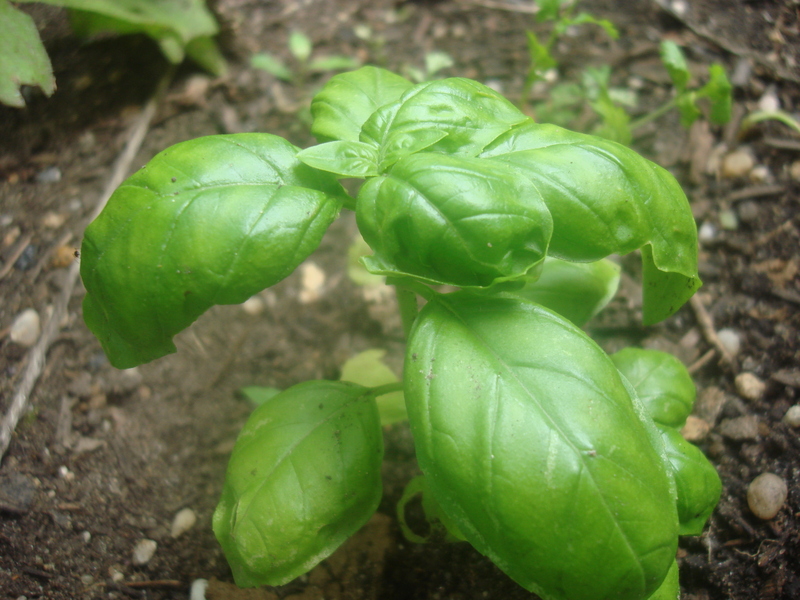 It is high season for basil, which means high season for pesto. 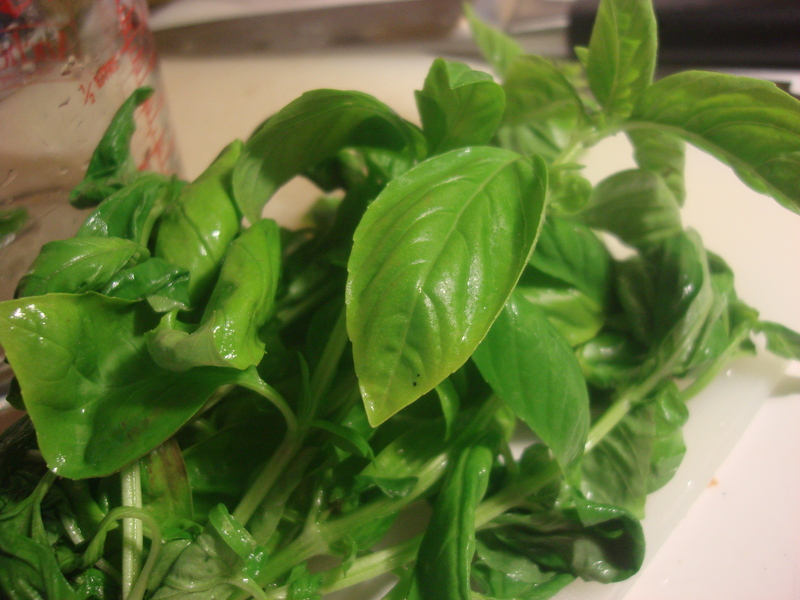 I forgot to pick up basil from the farm this week, but one of the neighbors’ friends, in gratitude for Sangría Night, sent some over from the overabundance in her own garden. 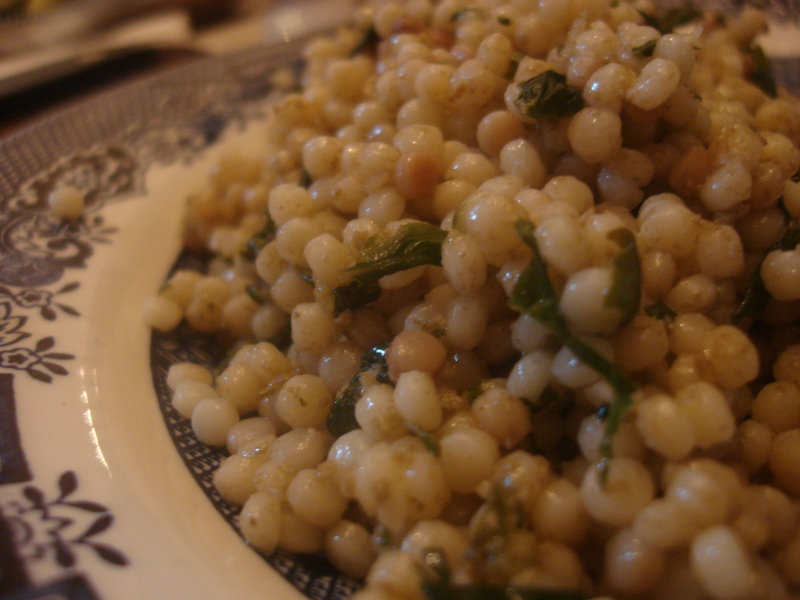 Between that and my little plants scattered around the yard, I had enough for a quickie pesto for Leandro’s couscous. From our garden – not the greatest shot, but the other ones showed all the perforations from unknown creatures feasting merrily on my herbs! He was tremendously excited at every turn, making me smell all the different aromas as we added ingredients to the mortar. 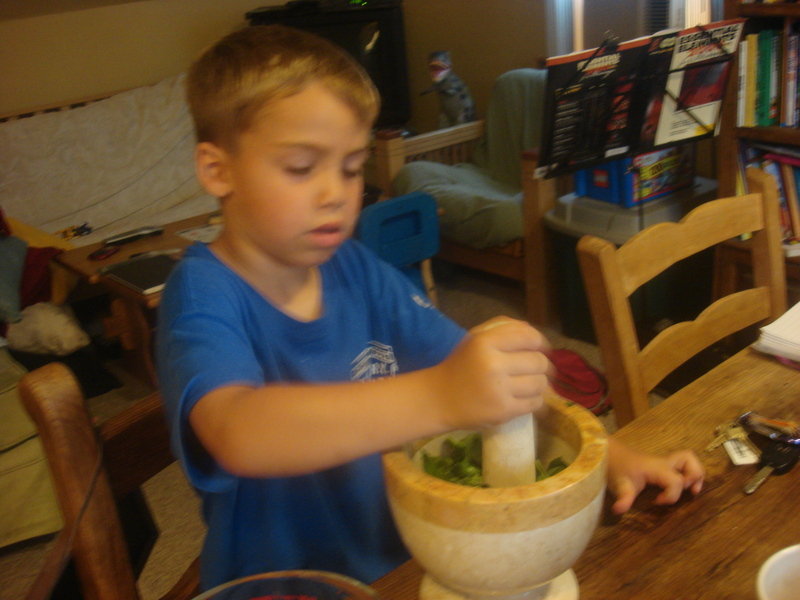 We mixed it into couscous for lunch with the grands and wasn’t he so proud to have made The Best Pesto Ever? We were proud too and it really was delicious. 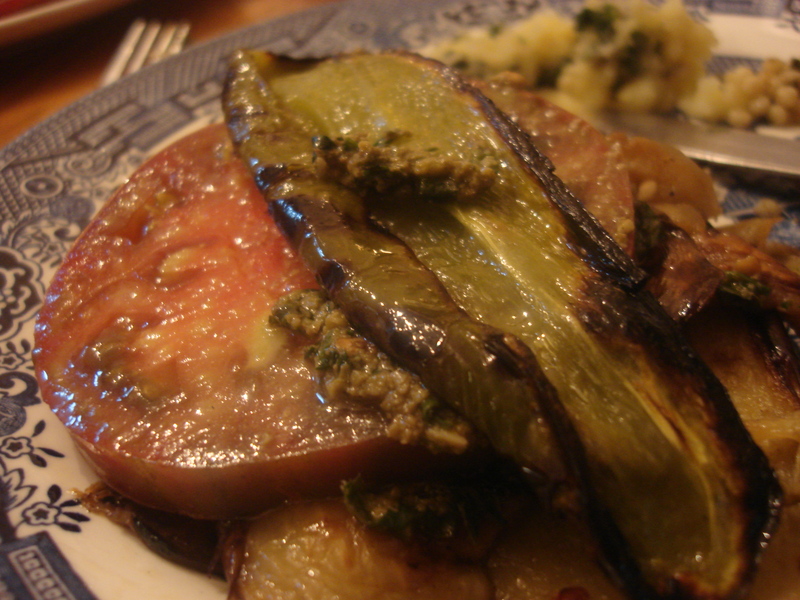 I also used some of it to spread on roasted eggplant, peppers and zucchini. What a terrific lunch! And a wonderful kitchen experience! Note the unorthodox use of walnuts (Poor Marcella Hazan; I use her The Essentials of Classic Italian Cooking all the time, but never quite stick to the classical line). I can’t afford to keep pine nuts around so walnuts were a worthy and handy substitute. (Mind you, with the price of walnuts rising — around $18 now for a 3-lb bag at Costco these days, up from $15 not too many months ago — who knows how long I’ll be able to afford those!). 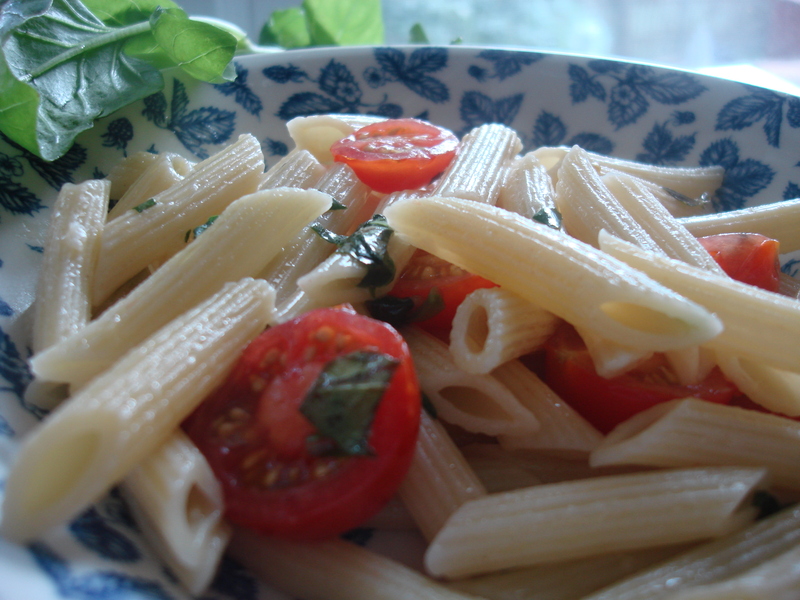 Also, this recipe can certainly be increased; I only had a cup of basil. 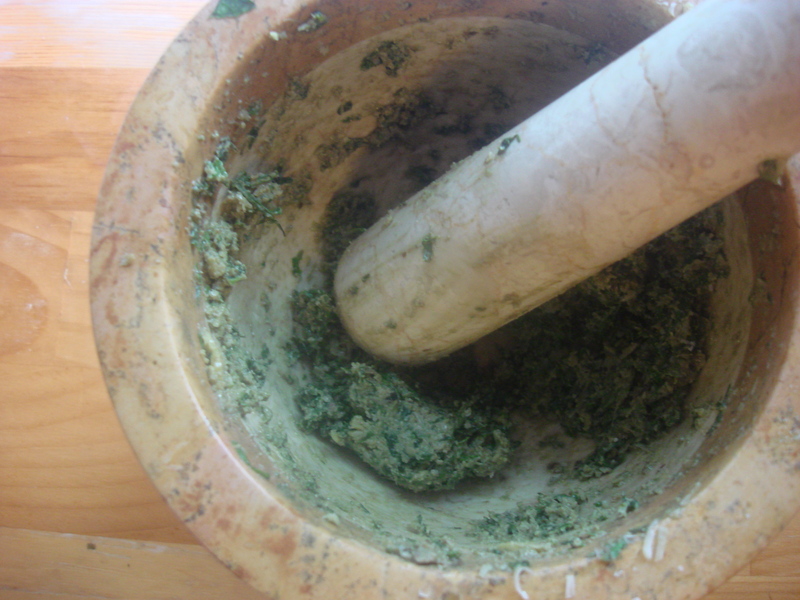 In a mortar and pestle (marble mortar with wooden pestle is what Marcella Hazan recommends; I use all marble) grind basil leaves, garlic, walnuts, and sea salt into a paste. Add cheese and use pestle to mix well. Add the oil in a thin stream, mixing well with a wooden spoon. 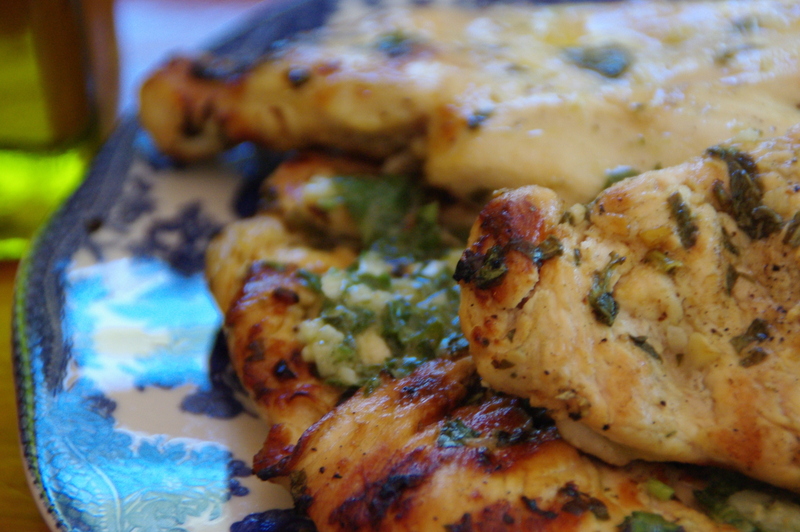 Grilled Lemon Chicken – Bring on the Barbecue Season! Bored with boring, boring chicken? 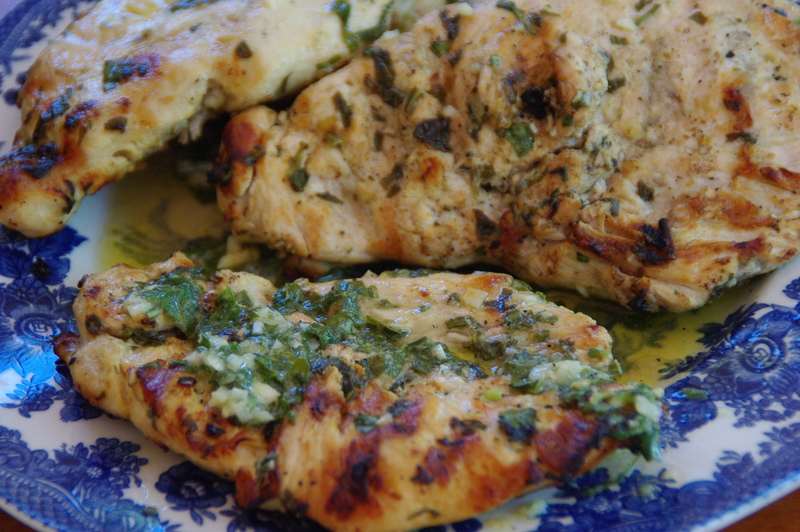 So was I, until I remembered this quick marinade with the fresh flavors that Spring demands: lemon, basil and garlic. You basically toss it all together in a sealable plastic bag or tub in the morning, and by the time you get home from work it is ready for the grill. Add some grilled veggies, a salad, or some couscous and you could be eating really delicious food about 15 minutes after walking in the door. Try it out this Memorial Day Weekend and you’ll be going back to it all summer long. Leftovers are great for next-day sandwiches or salad toppers. Thanks to Food To Live By by Myra Goodman (of Earthbound Farms) for the inspiration for this adaptation. In a separate bowl, whisk lemon juice, olive oil(s), garlic, basil, salt, and pepper. Add to bag, seal and refrigerate for a minimum of 3 hours. Preheat barbecue grill to medium-high or heat up your grill pan and spray a bit of cooking oil (only if your pan tends to stick). Remove chicken from bag and discard remaining marinade. Grill, turning twice, about 4- 6 minutes on each side, depending on thickness, until fully-cooked (there should be no pinkness in the center). 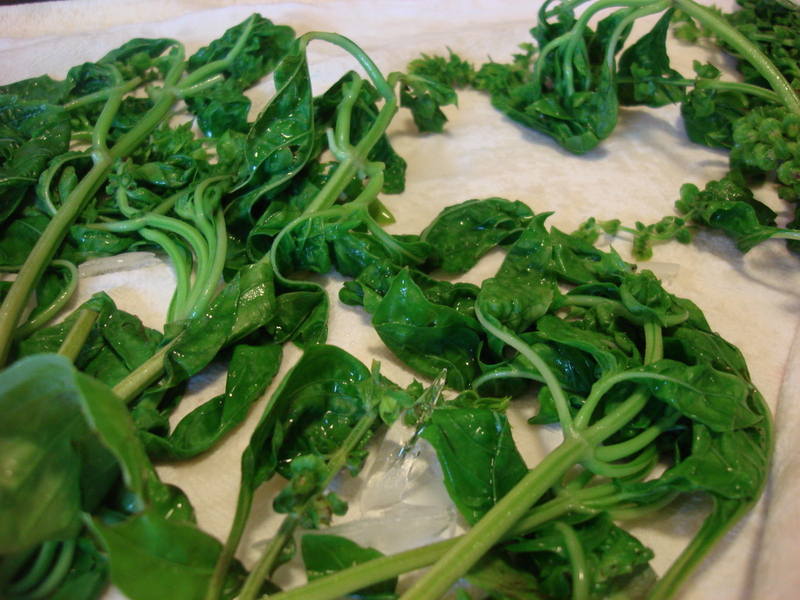 Serve with a salad or couscous or pasta with pesto!